Known as the Cape honeysuckle, this evergreen climbing shrub is grown mainly for the flowers which are pollinated by sunbirds in its natural habitat on the cape of South Africa. The Mediterranean house plays host to plants from further flung regions of the world with climates similar to those of our sun-soaked European neighbours. In our climate Tecoma capensis is best grown under glass in full sun where it will grow to 2-3 metres and produce long slender vivid apricot-orange flowers, delighting us with its southern hemispheric charms throughout the winter and into spring. When growing under glass beware of the threat of red spider mites and whitefly. 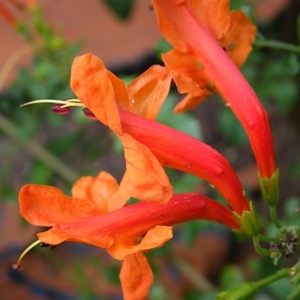 Tecoma capensis can also be grown outside in a pot for the summer and then brought inside for protection over winter.